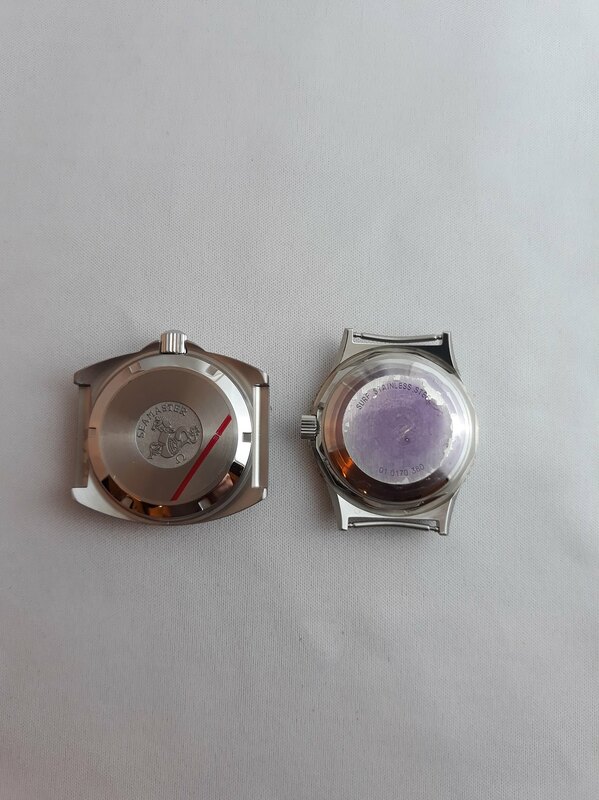 CASE & CASEBACK: Large, angular and distinctive octagonal case measures 43mm wide (including crown guards) x 49mm long x 13mm tall. Being originally new old stock and then worn sparingly it is quite clean and unpolished with all edges and bevels sharp and the original satin finish present. There are barely any marks and it is Near Mint+. 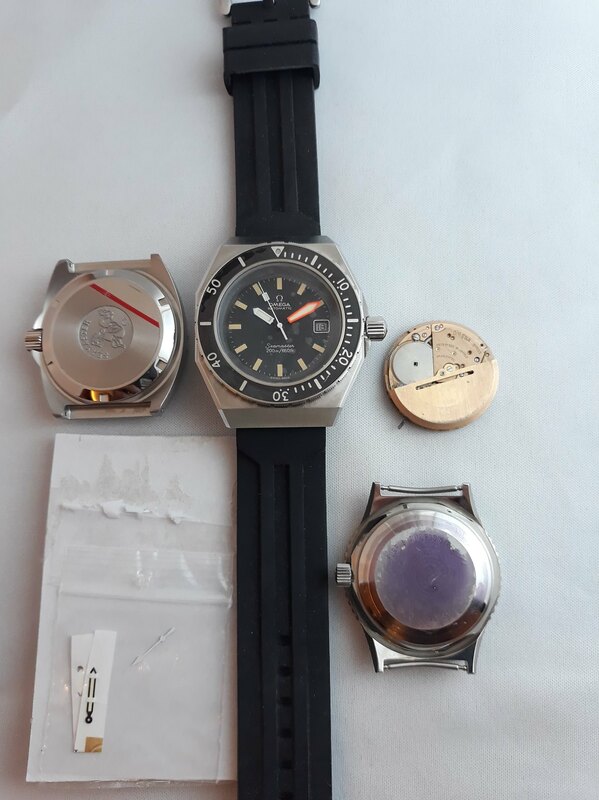 The outer caseback also has barely any marks with the Seamaster symbol and "Tested 200M" text crisp as when new--externally likewise Near Mint+ cosmetic condition. 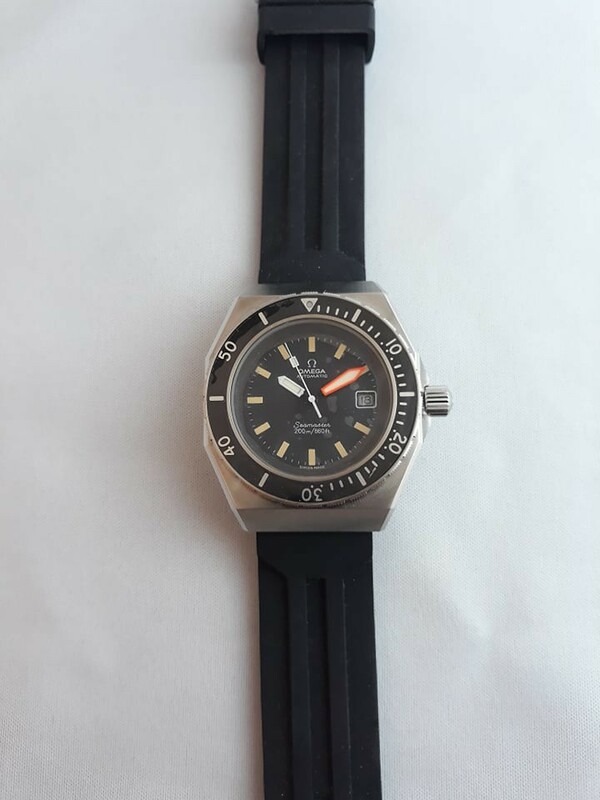 The inner caseback has no corrosion and shows all the correct original Omega nomenclature of the period, including the proper reference number for this case shape of Seamaster 200. DIAL & HANDS: Mint matte black dial with framed date at "3" and brightly glowing Luminova lume bars. Dial text and hash marks are all crisp. The big orange Ploprof minute hand and white hour and sweep seconds hands are also Luminova filled and Mint. This is a great looking modern incarnation of this dial & handset that glows brightly and is fully functional in low light. CROWN: Easy to grip correct signed Omega screw-down crown is Mint. The crown screws down tightly to the case and pulls out to the winding, quickset date and hacking time-setting positions as it should. 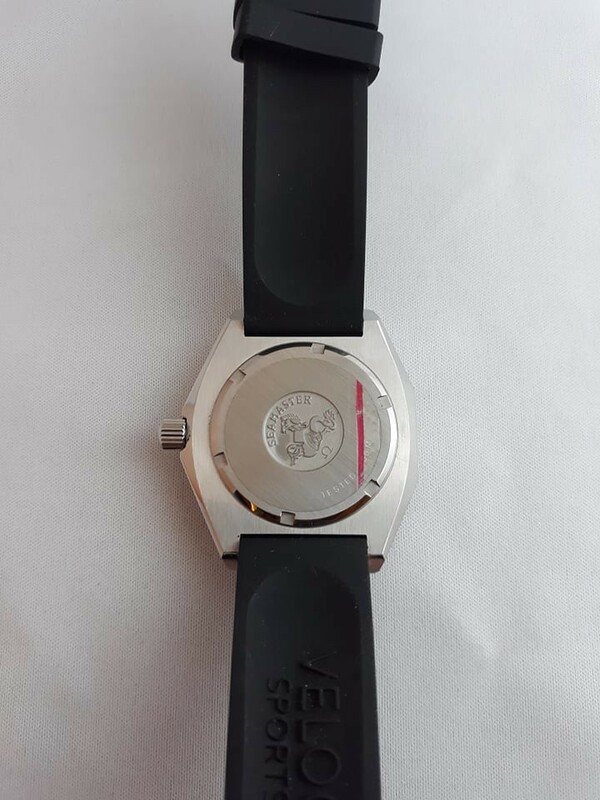 CRYSTAL: Flat mineral crystal is perfectly clear and sits correctly just below the bezel. It is Mint without any marks whatsoever. 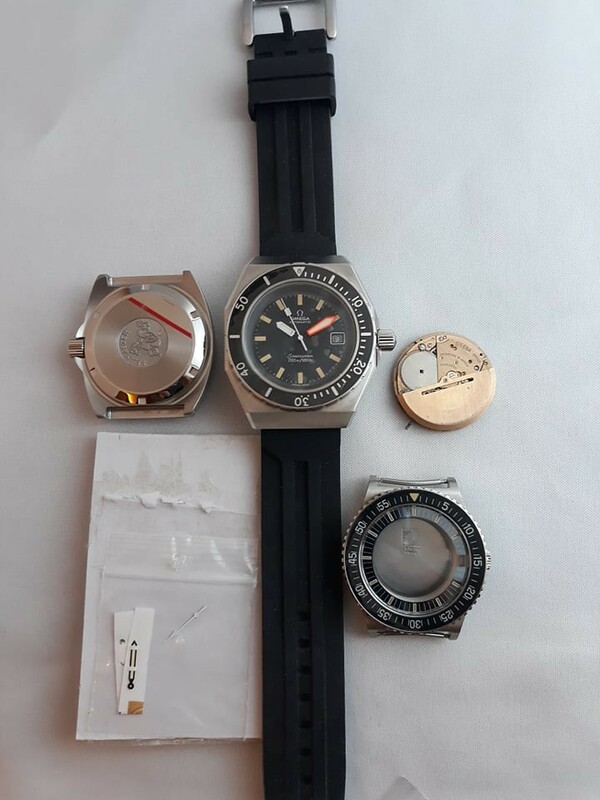 BEZEL: Thick ratcheting bidirectional rotating elapsed time bezel is tight and clean with sharp, well defined knurling, Mint condition. 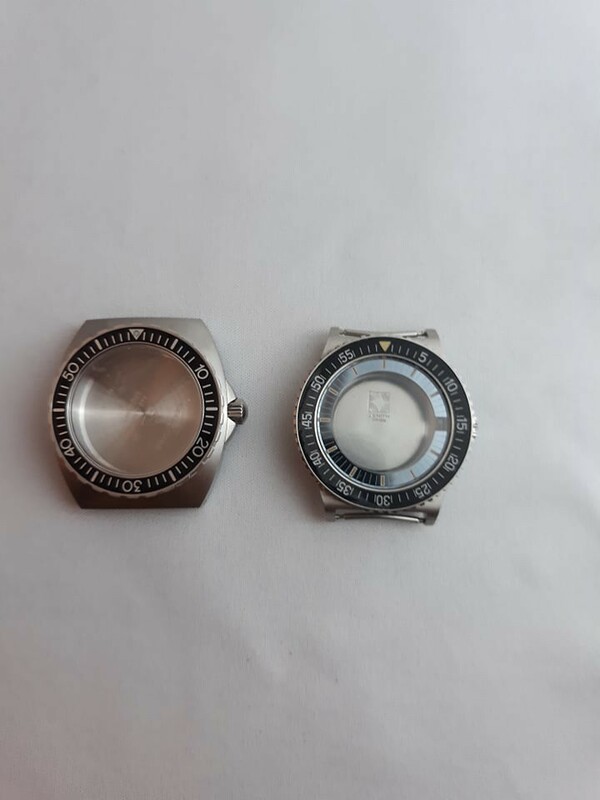 The black & silver metal inlay shows no marks, likewise Mint condition, and it retains its luminous Luminova pip within the triangle at "12".